Some of the most important decisions when ordering tags and labels are what finishing options will make them the most usable in your applications. We can work with you to determine what will work best. Perforating creates areas that are removed while leaving much of the stock intact to allow for ease of tearing a portion of the tag or label off. Scoring impresses or indents an area to make it easier to fold. Many tags are created with reinforced holes or fiber patches. Badger uses a brown circular fiber patch as the standard but can also add bar patches. In addition we can add a metal eyelet for additional reinforcement and strength. Strip patch and color patches are available at an additional charge. Tags to hang on doors or mirrors can be produced with a large hole and slit. Shrink-wrapping adds a great protective seal when tags or labels have to be stored for a period of time. We can shrink-wrap in just about any quantity per pack or roll. This also makes it easy to sell in bundles of a specific amount. We can include extras such as wires, strings or plastic coated wires into the pack. To protect the information printed on either tags or labels, you can add lamination to them. Choose from gloss or matte depending on the reflectiveness you need. 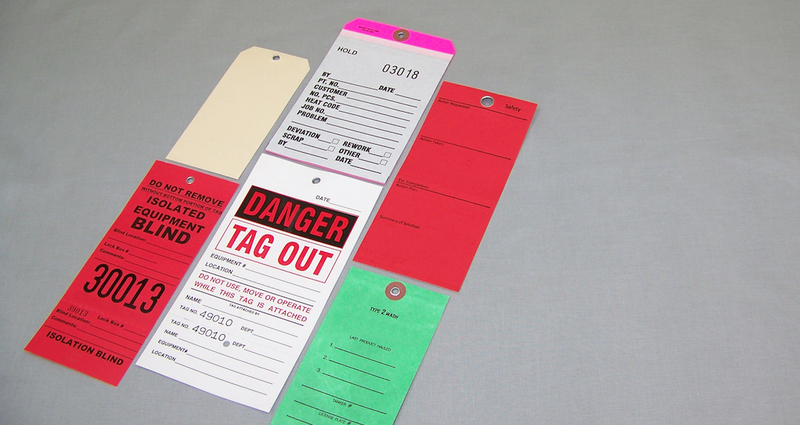 Adding UV coating to tags or labels makes them resistant to the damaging effects of the sun. Tags with large hole and slit for doors or mirrors.